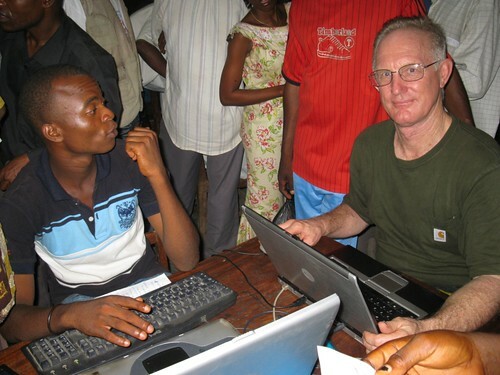 A few years back, the American Aid Organization, USAID, provided support for an enterprising NGO to open an internet access point in Kindu, the first ever for this provincial capital. Its name, Horizon, reflects its forward-looking aspirations. It is still one of only two public connections to the World Wide Web in the entire province. When we are in Kindu we make daily pilgrimages to Horizon to check email. John on line at Kindu’s “Horizon”. The internet connection is never great—slow and broken. What with Kindu’s chronic lack of electric power, the cyber café is usually only open part time with a small gasoline powered generator. Often the generator runs down to empty. Then lights, connection, computers, all go out at once. And we close up for the day. The VIP table where we can usually squeeze in. 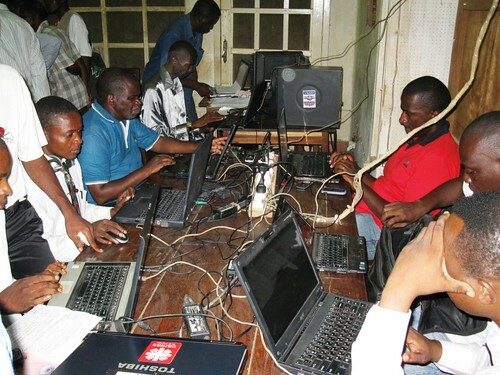 None of this has kept the residents of Maniema Province from acquiring a taste for the internet. Every day more and more crowd into Horizon, and more and more are coming with lap tops. A “VIP” table has been set aside for those with their own machines. You just connect to one of the lines, program in the IP address and the World Wide Web is yours…Or so it is in theory. The packed tables certainly are a deterrent to the viewing of certain “sensitive” sites. A furtive glance at some of my neighbors’ screens reveal that scam emails from Bill Gates, sham lotteries and others are an important part of daily communication. The reach of SPAM is truly phenomenal. Since bank accounts, much less credit cards, are rare, no harm done. You are the One and Only BIG Winner. The real challenge is to find my way through all of the wires and electric cords. The abiding fear is that someone pulling away from the table will drag the whole lot, including my computer, crashing to the floor. From John, after two weeks of Kindu on diplomatic mission. Added benefit, wherever there is a generator running, there is a wire leading to the roadside Recharge Center where little brother is making a daily wage keeping Kindu’s cell phone batteries charged. This entry was written by Terese Hart, posted on 2010-03-01 at 12:41 pm, filed under About the project, Kindu. Bookmark the permalink. Follow any comments here with the RSS feed for this post. Post a comment or leave a trackback: Trackback URL. It’s great to see the Internet spread like this. 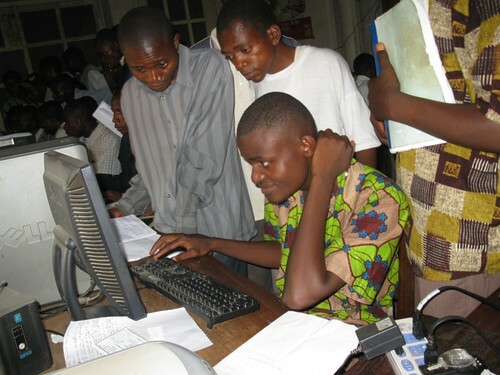 The combination of Linux and the Internet can definitely help create a big sector in smaller economies such as DR Congo. I wonder if any of those ‘Nigerian Princes’ or ‘Bill Gates’ you mention are already beginning to earn anything. We’re really pleased with this act and we thank you can actually enjoy the few services you render to our small business, despite the enormous difficulties which lie at some point. But despite this we are willing to help. Cyber Horizons is an Internet service that was created in 2004 following funding from USAID which this funding has been awarded in several provinces and among the cyber, Cyber Horizons is one of Kindu, which continues to exist until to date. That is how we strive to serve you. 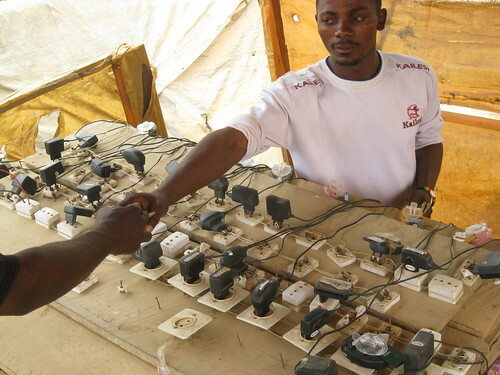 He made only Kindu, we had several other services that made the connection including TV Centre Fondak and those – they also have closed doors until the time for reasons of nonpayment of fees and the Internet various taxes imposed on them and they – have been financed by other vendors. Thus we are confident that efforts to provide some in fact our house does not fall into bankruptcy. We are really pleased with your appreciation ..
We’re really pleased with this act and we thank you can actually enjoy the few services we provide to our small business, despite the enormous difficulties which lie at some point. But despite this we are willing to help. We sincerely hope that you do not go bankrupt as you provide a very critical service not only to us but to the university community of Kindu as well.